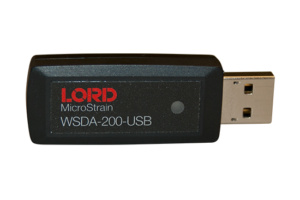 LORD MicroStrain have recently introduced their WSDA®-200-USB which is a USB stick design data acquisition gateway designed to configure, co-ordinate, and collect sensor data from LORD Sensing wireless sensor nodes for viewing, analysis, and storage. The gateway also facilitates precision sampling synchronization between sensor nodes by transmitting a continuous, system-wide timing reference known as the beacon, and thus provides seamless ± 50 μsec node-to-node synchronization communication between the wireless sensor nodes and the host computer. They are compatible with LORD Sensing LXRS and the latest LXRS+ nodes which enables highspeed, synchronized sampling and lossless data throughput at rates up to 16 ksamples/s, albeit with a reduced sensor range. The dimensions of this new base station are 58.2 mm x 20.3 mm x 10.8 mm, and it weighs just 17 grams. It can be supplied with a built-in antenna, or with an external antenna for use where the wireless communication environment may not be ideal for the built-in antenna and with the WSDA ® -200-USB fitted directly into the computer port.